In The Human Front and Descent, writer Ken MacLeod departs from the demand made by authors such as Alasdair Gray to make Scotland visible in fiction, going a step further, as MacLeod also offers a regeneration, a new insight into Scotland’s possible futures. There is an implicit political stance: Scotland must be (re)imagined, but bearing in mind a wider approach to the local that also encompasses the universal, with considerations about ecology, the global economic world-system or the possible existence of extraterrestrial civilizations. 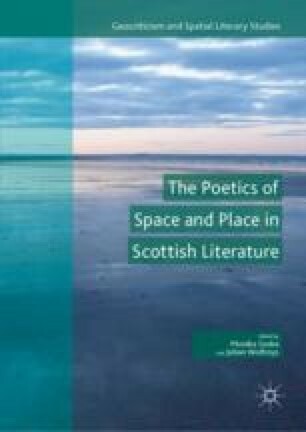 Both texts are located in Scotland in the near future and portray new configurations of space where the local cannot be understood without the global. Locality, like time, is understood as being engaged in a dynamics of interconnectedness. Therefore, my analysis will focus on the interconnectedness of the different spaces presented. From a transmodern methodological perspective, space-time has been reconfigured in both texts, creating a new paradigm, where past, present and future overlap, and place has become glocal. Through the use of various mechanisms and topoi, readers are presented with a “transmodern virtuality”. This transmodern space-time creates a new territory where the glocal and the virtual meet in a new multifold reality without ever losing its local specificity. The research carried out for the writing of this article is part of a project financed by the Spanish Ministry of Economy, Industry and Competitiveness (MINECO) in collaboration with the European Regional Development Fund (DGI/ERDF) (code FFI2017-84258-P), and a project financed by the Centro Universitario de la Defensa Zaragoza (CUD2017-01). The author is also thankful for the support of the Government of Aragón and the European Social Fund (ESF) (code H03_17R). Dailyrecord. ‘MoD Admit They Probed Claims of UFOs Over Greenock and Renfrewshire’. 1 July 2012. http://www.dailyrecord.co.uk/news/uk-world-news/mod-admit-they-probed-claims-of-ufos-1106682#XKpcdo1R0WcYDiFI.97. Web. Greenock Telegraph. ‘UFO Sightings Probed by MOD’. 28 June 2011. http://www.greenocktelegraph.co.uk/news/13999863.UFO_sightings_probed_by_MOD/?commentSort=score. Web. ———. ‘The Future Will Happen Here Too’. The Bottle Imp, Vol. 18, 2015 (2010). http://asls.arts.gla.ac.uk/SWE/TBI/TBIIssue18/MacLeod.pdf. Web. 11 November 2016. ———. ‘Ken MacLeod on Scotland in Science Fiction’. 19 November 2014. http://www.orbitbooks.net/2014/11/19/ken-macleod-descent-scottish-science-fiction/. 2014. Web. 12 December 2017. Rick, A. ‘What Space Makes of Us: Third Space, Identity Politics, and Multiculturalism’, UCLA, American Educational Research Association Conference, Chicago. 1997. http://files.eric.ed.gov/fulltext/ED409409.pdf. Web. 28 October 2016. Tambasco, Brandi. ‘Science Fiction: Spanning Space, Time, and Genre’. Notes. The New York Society Library 18:4 (2011). https://www.nysoclib.org/sites/default/files/pdf/news2011_11.pdf. Web. 17 December 2016. The Scotsman. ‘They’re Out There’. 26 July 2007. http://www.scotsman.com/news/they-re-out-there-1-910687#ixzz47aZOM37c. Web. 17 December 2016.